It’s summer and the livin’ is easy!! Lots of summer party invites call for a Gluten Free strategy. Always take a Gluten Free item with you when going to a potluck, grill out, pool party or picnic. One of the easiest and healthiest things to take is cut up fruit. 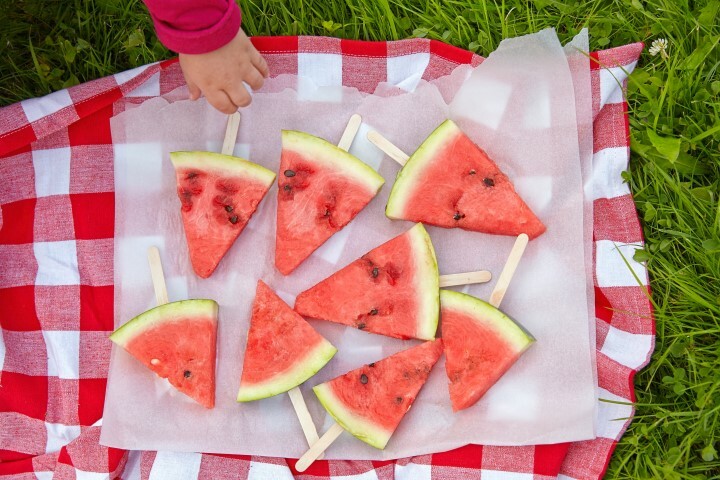 Watermelon on a stick is a perfect example! The kids love it and it’s easy, healthy & fun. Cut up apples are always a great hit too. Use a apple slicer to cut even pieces and remove the core. Put apples in a container and sprinkle with a little lemon juice to prevent browning. Sliced up fresh pineapple goes well be many grilled meats. Slice off both ends and quarter the fruit down the middle. Trim off the outer peel and the inner core. Slice cross-wise to make pineapple spears. Cantaloupe and other melons are in season in the summer. Try making melon balls with a scoop or try making fruit kabobs with different melons and bamboo sticks. Of course fresh grapes are always a hit. The grapes will stay plump longer if you can divide them into small clusters and they continue to be attached to the stem. Bananas can be served whole or cut in half. Quickly dip a half cut banana in lemon juice to prevent it from browning before it is eaten. Peaches, plums nd apricots are very yummy in the summer. Just wash off gently. They can be eaten whole or cut in half to remove the pit.